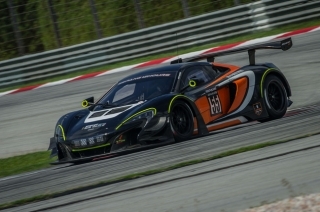 Posted on 17, December 2015 by EuropaWire PR Editors | This entry was posted in Automotive, Sports, United Kingdom and tagged Andrew Kirkaldy, McLaren 650S GT3, Sepang 12 Hours. Bookmark the permalink. SURREY, 17-12-2015 — /EuropaWire/ — The McLaren 650S GT3 claimed class victory and fourth place overall at the Sepang 12 Hours this weekend, bringing an end to the competitive debut season of the car, and crowning what has been the most successful campaign to-date for the Woking outfit. McLaren GT Factory Driver Alvaro Parente and Young Driver Andrew Watson joined customer team FFF-Racing to secure a hard-fought victory in the Pro-Am category, and narrowly missed a podium finish overall as the flag fell after 12 hours of close racing. Teamed with Hiroshi Hamaguchi (JPN) and FFF Racing team principal Andrea Caldarelli (ITA), each driver has experienced victory with the 650S GT3 during the season, but this was the first time they quartet had shared driving responsibilities with each other. With the car arriving straight from the challenging streets of Macau where it competed in the FIA GT World Cup, the team and drivers showed strong pace in the early sessions and qualifying saw Parente secure third place on the grid with the #55 650S GT3. The race started in the dry, with Parente holding third place, pushing the lead pair hard in the opening stint. Positions changed as the rounds of pitstops started, and dropping to fourth place overall, the FFF-Racing team maintained a strong hold over the Pro-Am class lead. After around four hours in, the rain started to fall, with conditions quickly deteriorating as the team maintained position. The conditions became so bad that the race was red-flagged before the grid was lined up to run behind the Safety Car as the rain eased off in the second half of the event. As running recommenced, the #55 650S GT3 of FFF-Racing was in a strong position, leading the Pro-Am class, and running consistently quick laps closing the gap to the leaders in the tricky conditions. McLaren GT Young Driver Andrew Watson showed no signs to highlight it was his first endurance race, with strong lap times ensuring he maintained position around the 5.543km circuit. Track condition remained wet until the 12 hour mark with Caldarelli bringing the car home for class victory and fourth place overall. The win marks the 24th victory of the year, marking 2015 as the most successful campaign for McLaren GT since it debuted during 2012. ‘Congratulations to FFF-Racing on a well-deserved win and a great drive by all. It was a great effort by all the drivers. Team regulars Hiroshi [Hamaguchi] and Andrea [Caldarelli] again proved to be quick, building on the strong season they have enjoyed this year, and showed their skills in challenging conditions. Young Driver Andrew [Watson] should be commended for his drive and how he handled the race – as part of the McLaren GT Young Driver Programme, we have looked to push him and improve his skill-set throughout the season, and this weekend was the biggest challenge so far this season which he relished. Alvaro [Parente] also showed his professionalism and quality, as he has all year, and once again proved himself as one of the most consistently fast drivers on the grid. ‘The result in Sepang marks the 24th win of the season, and the 650S GT3 has enjoyed a rich run of success this season with our customer teams across the world which started back in February. Since then, each of the teams have put the cars through the most rigorous and challenging season across the globe, and the competition on the grids has been of the highest level I can recall. Despite these demands, the 650S GT3 has proven itself as the car to beat on all continents and in each series. A selection of images accompanying this release is available to view and download from the McLaren Automotive media site – cars.mclaren.press. High resolution images are available directly from the SRO and Sepang 12-Hours website –www.sepang12hours.com/gallery.php. In the development, engineering and manufacture of the innovative and highly acclaimed 650S sports car and 650S GT3 racer, McLaren Automotive and McLaren GT have partnered with world leading companies to provide specialist expertise and technology.